One Perfect Little Miracle: The Seedy Side of Life. 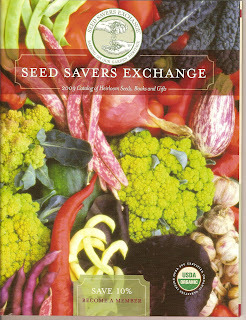 The 2009 Seed Savers Exchange Catalogue. One cannot gaze upon the color and texture on these pages and not feel deliriously happy. Have you ever seen such rich, lush color? I want to grow all of the tomatoes. My pepper-eating child will not be here, so no peppers in the garden. I'll get them at the Farmer's Market instead. That will leave room for something else in their place. Believe it or not, when I am reading through this catalogue, I feel better. My thoughts travel to the out-of-doors to warmer days and plunging my trowel into the earth and placing tiny seeds in shallow troughs. My fingers trail over them, giving them a warm blanket of dirt to keep them protected until the place around them is warm enough to stir them into action. I love seeds. I grew the Sultan's Golden Crescent beans last summer. They are on the bottom row, center. Wildly productive and very delicious, I am looking forward to having them dress my garden once again. 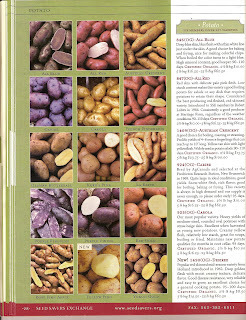 Potatoes of every shape, size and color entice this girl to get better, if only to begin preparing the garden plot for the arrival of spring. Ah, yes. 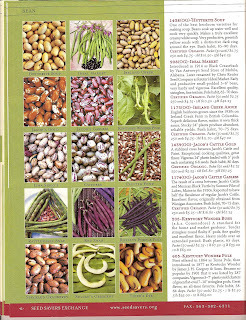 Seed catalogues. They warm the cockles of my heart. Gardening is something on which I gave up years ago; it's too hot here to keep things nice and green, although one year I did have tomatoes in January. Looking forward to seeing your garden once you have it tilled and ready. 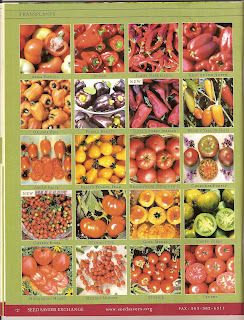 Garden catalogues in the winter is one of the true pleasures of life. What is it about seeds? I just can't get enough of them either. Those beans are beautiful! I can see why you had to try them. Hope you feel better soon.